This book, originally published in English in 1930 is a vivid account of the life and problems of Russia in the first decades of the twentieth century. 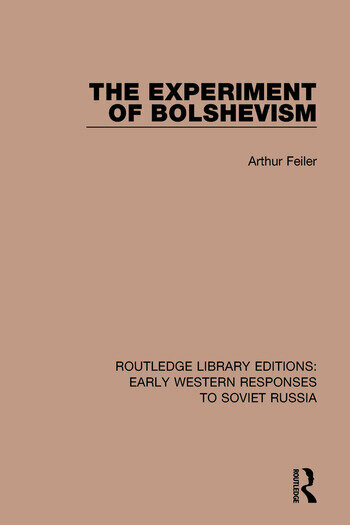 The typical features of existence in the proletarian state are discussed in connection with an exhaustive analysis of the whole experiment of Bolshevism and the developments of economic policy are clearly explained and discussed. 1. The Pathos of Revolution 2. The Proletarian Way of Life 3. The Basis of the Experiment 4. The High Commands of Bolshevism 5. The Five-Year Plan 6. Industry Under Bolshevism 7. Islets of Capitalism 8. The Worker Under Bolshevism 9. The Peasant Under Bolshevism 10. Agrarian Communism 11. The Political Rule of the Dictatorship 12. The Old Faith and the New 13. The New Society 14. The Interim Balance Sheet. Epilogue.